Boston went 3-8 against Seattle, Oakland and Arizona, its worst start since losing nine of 11 in 2011. The Red Sox host Toronto on Tuesday, their first game at Fenway Park since winning the World Series at Dodger Stadium last October. 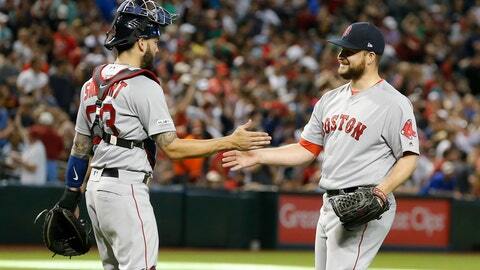 Hector Velázquez, Brandon Workman, Marcus Walden (1-0), Matt Barnes and Ryan Brasier combined on a three-hitter. Walden got six outs for his first major league victory and Brasier retired Adam Jones on a game-ending groundout with a runner on second. BALTIMORE (AP) — Gary Sánchez hit three of the Yankees‘ seven home runs, their most on the road since 1961, and New York completed a three-game sweep to move back above .500 at 5-4. Clint Frazier homered twice and had four hits, and Austin Romine and Gleyber Torres also went deep. New York’s first 18 runs of the series scored on homers, and the Yankees hit 14 over the three games. Domingo German (2-0) gave up two runs, one hit and two walks in six-plus innings, and David Hess (1-1) allowed four runs and five hits in five innings. Chris Davis was 0 for 4 and is hitless in 44 at-bats since Sept. 14, two shy of the major league record for a position player set by the Los Angeles Dodgers‘ Eugenio Velez in 2011. ANAHEIM, Calif. (AP) — Mike Trout homered for the fourth straight game and Los Angeles won after waiting out a five-minute delay caused by a swarm of bees in the fifth. Trout hit five home runs in the four-game series, going 6 for 11 with nine RBIs. He hit a two-run drive off Kyle Bird in the sixth inning for a 6-2 lead. Justin Anderson (2-0) threw a scoreless inning in relief. Shelby Miller (0-1) gave up four runs, four hits and three walks in two innings. DENVER (AP) — Cody Bellinger homered again, Max Muncy also went deep and Los Angeles outslugged Colorado. Colorado has lost seven of eight since starting the season with two wins. Nolan Arenado had three hits and three RBIs but Charlie Blackmon committed two embarrassing errors in right field. Chad Bettis (0-2) took the loss. SAN FRANCISCO (AP) — Tampa Bay manager Kevin Cash moved left-handed reliever Adam Kolarek to first base in a piece of matchup strategy, and the Rays opened with three straight series wins for the first time. Kolarek pitched a perfect sixth inning to protect a 2-0 lead and moved to first base with a man on in the seventh when righty Chaz Roe reliever to strike out lefty-swinging Brandon Belt. Kolarek returned to the mound, gave up a single and was replaced for good by Diego Castillo. Yandy Diaz homered on the second pitch of the game from Drew Pomeranz (0-1), and Yonny Chirinos (2-0) allowed two hits in five innings. José Alvarado pitched around a hit and a walk in the ninth for his fourth save. MILWAUKEE (AP) — Christian Yelich hit his fifth homer this season and 100th of his career, a drive off Kyle Hendricks (0-2), Yelich had three RBIs, and Josh Hader struck out three over 2 2/3 perfect innings for his fifth save as Milwaukee won for the seventh time in eight games. Chicago lost for the seventh time in eight games, dropping to 2-7. Zach Davies (1-0) allowed a pair of unearned runs in 5 2/3 innings. The Brewers have won 15 of their last 16 regular season series dating to last year. PHILADELPHIA (AP) — Rhys Hoskins hit a two-run homer in the sixth inning off José Berrios (1-1), and Philadelphia improved to 6-2. Zach Eflin (2-0) allowed a leadoff homer to Max Kepler and five singles, striking out five, and Hector Neris tossed a perfect ninth for his first save since last Sept. 18. Phillies left fielder Andrew McCutchen made a perfect one-hop throw to the plate to prevent Marwin Gonzalez from scoring on Ehire Adrianza’s single in the third. CLEVELAND (AP) — Mike Clevinger (1-0) struck out 10 and allowed one hit over five scoreless innings, then left with upper back tightness, as Cleveland completed a four-game sweep. Indians pitchers struck out 16, raising their three-game total to 57. Brad Hand got five outs for his fourth save, completing a three-hitter. Toronto dropped to 3-8 and has struck out a major league-leading 111 times. Carlos Santana had an RBI double in a two-run first that included Tyler Naquin’s run-scoring single. Jose Ramirez added an RBI double in the fifth. DETROIT (AP) — Tyson Ross (1-1) allowed one run and five hits over seven innings in his debut at Comerica Park debut, the last current ballpark he hadn’t pitched in, and Detroit won its fifth straight. Rookie Christin Stewart drove in two runs off Brad Keller (1-1) to help the Tigers complete a three-game sweep. Shane Greene got three outs and has saves in all seven Tigers victories. Center fielder Niko Goodrum ended the game with a diving catch of Hunter Dozier’s liner with a man on. Kansas City has lost six straight. Whit Merrifield extended his hitting streak to 28 games dating to last season. NEW YORK (AP) — Max Scherzer (1-2) allowed four runs and eight hits in 6 1/3 innings with seven strikeouts, no walks and two hit batters, and he also singled in the game’s first run. Anthony Rendon homered for the fourth time in five games, a three-run drive as Washington opened a 12-1 lead, and the Nationals were helped by 12 walks. Zack Wheeler (0-1) gave up seven runs, four hits and a career-high seven walks in 4 2/3 innings. ATLANTA (AP) — Dansby Swanson hit a game-ending single off Adam Conley (0-2) against a five-man infield after Ronald Acuña Jr. reached on a catcher’s catcher’s interference call on Chad Wallach after his apparent double-play grounder. Pinch-hitter Curtis Granderson hit a tying homer in the ninth off Arodys Vizcaíno (1-0). Freddie Freeman hit a two-run homer off Caleb Smith in the first inning. PITTSBURGH (AP) — A charged-up Yasiel Puig barreled into a bunch of Pirates during a bench-clearing fracas and was among five ejections. Derek Dietrich stood in the batter’s box to watch the first of his two homers, a 436-foot second-inning drive that bounced into the Allegheny River, and two innings later Chris Archer threw his first pitch behind Dietrich’s waist. Plate umpire Jeff Kellogg warned both benches and new Reds manager David Bell jogged from the dugout to the infield, arguing Archer should’ve been ejected. Tempers quickly escalated. The excitable Puig, in his first season with the Reds, grabbed Pirates bench coach Tom Prince and tried to put the 54-year-old former catcher in a headlock. Puig, Bell and Reds pitcher Amir Garrett were ejected, as were Pirates pitchers Keone Kela and Felipe Vazquez. Archer (1-0) allowed three runs and five hits in six innings. Josh Bell hit a 474-foot home run off Anthony DeSclafini (0-1) in the fourth that cleared the batter’s eye in center. HOUSTON (AP) — Jose Altuve drew a four-pitch walk from Blake Treinen (0-1) with the bases loaded and two outs in the ninth, giving Houston a three-game sweep. Roberto Osuna (1-0) struck out one in a perfect ninth. CHICAGO (AP) — Daniel Vogelbach homered twice, hit a bases-clearing double and set a career high with six RBIs as Seattle improved its best start to 9-2. Edwin Encarnación had a two-run homer and three hits for the Mariners. Wade LeBlanc (2-0) allowed six runs and six hits in six innings. Iván Nova (0-1) gave up seven runs and seven hits in 2 1/3 innings. ST. LOUIS (AP) — Adam Wainwright (1-0) gave up one run and five hits in six innings, struck out nine and didn’t issue a walk while throwing 100 pitches. Jordan Hicks got four outs for his first save. Paul DeJong hit a two-run double in the fourth off Matt Strahm (0-2).